Cody Teel, the 2012 world champion bull rider, rides during a recent rodeo. The top bull riders in rodeo will be part of the Xtreme Bulls Tour event in conjunction with the Parker County Frontier Days and PRCA Rodeo, which takes place next week. WEATHERFORD, Texas – When rodeo fans in Parker County had a stand-alone bull riding come to the area, they grew accustomed to the late-summer event. When it ended in 2012, it was like a void had hit Weatherford. 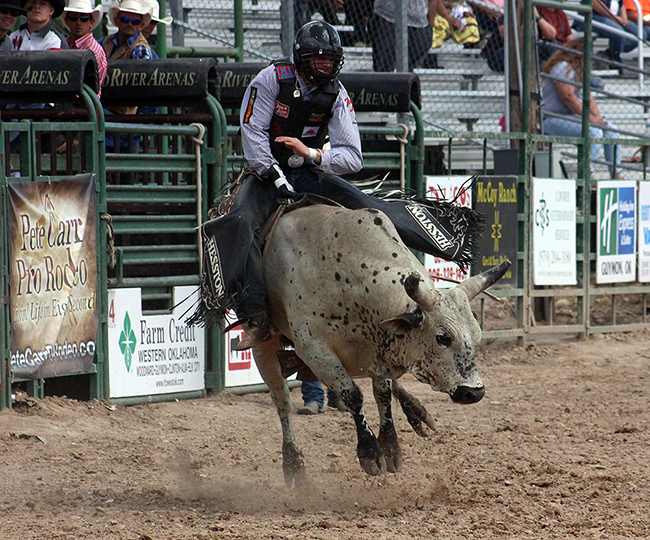 That void will be filled during this year’s Parker County Frontier Days and PRCA Rodeo with the inaugural Xtreme Bulls Tour event, set for 8 p.m. Tuesday, June 7. “We decided this year that we would step out of the box a little and add a fifth night to our rodeo with the Xtreme Bulls,” said Joe Harris, chairman of the Parker County Sheriff’s Posse, which organizes the annual rodeo. “This year will be a trial run and have it primarily be part of our traditional package. The rodeo is set for 8 p.m. Wednesday, June 8-Saturday, June 11, and all the activities will take place at the Parker County Sheriff’s Posse Arena. “We’ve had a great response so far when people hear we’re having it,” Harris said. There’s good reason. Bull riding has long been the most popular event in rodeo, and the Xtreme Bulls Tour has been a big hit since its inception more than a decade ago. In Weatherford, it’s all wrapped up in a world-class package that has history on its side. “The posse has been in Parker County since 1947,” Harris said. “We have maintained our same set of desires to promote and preserve the Western way of life, and our rodeo is a huge part of the county’s events. It has shown. It has been recognized as one of the top events in the country and is an attractive home to the top ProRodeo cowboys and cowgirls in the country every June – one key factor lies in Pete Carr’s Classic Pro Rodeo, the stock contractor in Weatherford every year. “Pete Carr is nothing but above board, generous and professional,” Harris said. “He’s got professional people that he brings in. We’ve maintained that professionalism, staying with a top-notch professional stock contractor and having the best people. Part of that involves the overall family-friendly entertainment that is the Parker County Frontier Days and PRCA Rodeo. That includes rodeo entertainer Keith Isley, who has been one of the most recognized and awarded rodeo clowns in the Professional Rodeo Cowboys Association. It’s the perfect way to wrap up a solid week of world-class rodeo action in Weatherford.